While the Whitsundays is famous for its glamorous tropical island resorts, it's also a mecca for backpackers from around the world. 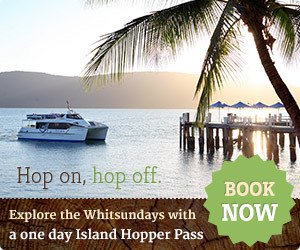 Because the region is about halfway between the Gold Coast and Cairns, the Whitsundays' astonishing beauty and adventurous spirit usually elicits a huge sigh of relief for anyone who's arrived in a Greyhound bus or a Kombi van. It's no surprise then that Airlie Beach is one of the most popular destinations for high school leavers during the Schoolies week festivities. With teenagers visiting from around Australia, accommodation can sometimes be tricky if you don't book well in advance - many teens have their Schoolies accommodation booked and paid for before they're even in their final year! Don't miss out on the best week of your life - book for next years Schoolies week online and save! For the best backpackers and budget accommodation deals in the Whitsundays check out HostelWorld's Airlie Beach hostel search (Select Australia as the country and choose 'Airlie Beach' as the city) - they've got hostels from $15 per night, or compare prices from a range of Whitsundays hostels.